For anyone who grew up with chrome and Bakelite in the kitchen, this book is your ticket to nostalgia. 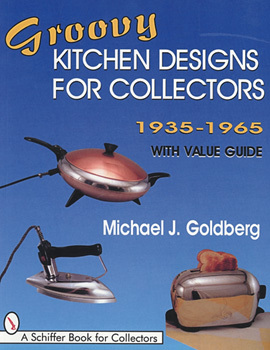 With over 300 illustrations of appliances and kitchenware plus lots of wonderful advertising, Groovy Kitchen Designs researches different types of metal and their applications as well as historical background on the companies behind the products. This introduction into the world of vintage electric and metal kitchen collectibles will be treasured by collectors and flea market frequenters alike.